The new Apple TV 4K biggest selling point is right in its name -- 4K. But, there's a lot of hardware inside to make that happen. Apple didn't skimp on the processor. The A10X fusion processor provides the oomph to drive all those pixels, with more bits per pixel than the last version. Coupled with the A10X Fusion processor is 3 gigabytes of RAM, and either 32 or 64 gigabytes of storage. This all connects to the world either with 802.11ac Wi-Fi or a new Gigabit Ethernet Port, as well as HDMI 2.0. The old USB-C port used for diagnostics and developers is gone, and has been replaced with communications across the network. All this is cooled by a fan -- the first of its kind inside the Apple TV. In our testing, streaming several consecutive hours of 4K HDR video, we couldn't even hear the fan farther than about 18 inches away from the device, and even then to be certain that the fan was running, we had to put our head directly on the device. Two feet is not in the realm of a normal large-screen television watching range, so this is utterly no problem. Even in a smaller environment, like a home office, the fan noise is essentially undetectable. Our primary testing locations were in a 18-foot by 16-foot living room with a HDR-compatible 55-inch Vizio P55-E1 with a viewing range of about 12 feet, and a Acer CB281HK 4K display with HDMI 2.0 that lacks HDR. We selected a few HDR titles to watch on both displays. Our selections were "Spider-Man: Homecoming," "The LEGO Movie," "Alien: Covenant." and "Brooklyn." All of the titles were streamed to the box from Apple's servers, and later to a fourth-generation Apple TV for comparison. The color gamut on the HDR television eclipsed what we've played back before, with nearly no color banding -- but you know that already. In both cases, the picture expressed more fine detail than the previous 1080p Apple TV did. The Vizio television performed profoundly better -- as you'd expect with the extra color range that HDR10 allows. At the range from the television to the couch, the enhancements provided by the Apple TV 4K still generated a "wow" from the summoned viewers for the viewing party. These expressions were muted a bit with the Acer display -- but at the 24-inch range from the monitor, the fine details expressed by the 4K picture were more evident than at the 12-foot viewing range to the television. So, it's a tradeoff. HDR is a fantastic addition to a living room entertainment center's presentation with the resolution making less impact. The 4K resolution even without HDR support clearly made a giant difference at monitor-viewing ranges. If a smaller home office is your preferred environment, we recommend you stick with a 4K display for now. An array of 4K displays with HDR are coming soon, but present offerings aren't what you'd call affordable. In many cases you can get a really big 4K HDR television for your living room for less money. Two years ago when Apple shipped the fourth-generation Apple TV with app support, it was immediately decried as sub-standard since it didn't support 4K. At the time, there was nearly no content, and the older third generation device was already starting to get a little long in the tooth. Since then, Netflix has beefed up its 4K library, and Amazon has started supporting it in the Fire TV series of devices. Netflix is already on the Apple TV 4K, and Amazon is coming. Even with the pair of streaming services, available 4K content is still an issue. The iTunes-hosted movies are great, but there aren't a lot of them, and there is still no 4K television programming. They will come, but they're just not here at present. The content crisis is alleviated somewhat by the deal that Apple struck with Hollywood to allow users with previously-purchased HD content from iTunes to get a 4K version -- if available. This applies to iTunes redemption codes included in Blu-Ray purchases, but not to SD versions of same. The Siri Remote is polarizing, and has been since it shipped with the fourth generation Apple TV. The ergonomics are such that it is easy to pick it up wrong-side-up, and flail away on the case of the device rather than the touch-sensitive pad before you realize that, no, the remote is the wrong way. Here at AppleInsider one of us just lives with it, and the other hangs the remote on the wall with a piece of velcro, with the hook-end also used as an orientation device. The new Apple TV 4K remote has a very subtle ridge on the Menu button. At first, we were dismissive of the effect that it would have on hand-feel and orientation of the unit, but after a very short adjustment period, it's easy enough to figure it out. Performance-wise, all other aspects of the remote are the same. If you liked it before, you still will. If you didn't, the first-generation white plastic Apple remote, and the second-generation metal one still work with the Apple TV. If you still hate the remote, use your iPhone, or train your favorite remote to talk to the Apple TV. It's pretty clear at this point that Apple is sticking with the design for a while. Apple, or Hollywood, or both, has decided that full 4K movies will not live on devices, and must be streamed. At present, with user-generated content, an iTunes-compliant H.264 4K file can be made in Handbrake. The video can be loaded in iTunes, and spotted by other iTunes libraries, and streamed from Mac to Mac. That same file will get spotted by the Apple TV 4K no problem, we streamed it with no issues whatsoever. A H.265 file can be generated with a nightly build of Handbrake that will play on a Mac with QuickTime Player, or from inside iTunes. The file can even take metadata for proper presentation on iTunes. But, we couldn't generate a H.265 file that would be recognized on the Apple TV. The file will load into iTunes, but Home Sharing just won't pick it up. This same file loaded into VLC plays fine, and isn't transcoded to a lower resolution. So, the lack of Home Sharing picking up the file isn't a technical limitation of the Apple TV 4K, and appears at this point to be a choice that someone made along the way to actively prevent this kind of thing. We contacted our regular sources within Apple to make heads-or-tails out of the lack of Home Sharing compatibility with H.265 files. At present, they have nothing to share. For now, if you have user-supplied 4K content you want to share through iTunes, stick with H.264 encoding. We'll keep our eyes on it going forward. Immediate reviews of the Apple TV 4K screamed blue murder about the lack of Dolby Atmos when the device shipped. But, this is a non-issue for two reasons. First, Dolby Atmos installations charitably start at $450 for a Denon receiver with no speakers, $600 for an in-the-box solution from Onkyo, and $900 for a soundbar-style installation with the LG SJ9. The assortment of Atmos-compatible gear is akin to a deep, dark hole that users can fall into, with adoption costs escalating rapidly. Second, Apple has already said that Atmos is on the way. Complaining about the device lacking the feature at launch serves no purpose, and seems to be looking for a reason to criticize it for the sage of argument and little else. Other grouses about the device include the lack of native resolution switching, and the difficulty of switching the device to a specific resolution as demanded by the user. While not inaccurate, the necessity of this for the mainstream user is unclear. Switching television resolutions isn't new to old-time computer users. But, it is for televisions, with it only having been made necessary in the last few years. So, Apple's relatively fixed resolution negotiated by the Apple TV 4K is a conscious choice to not do that, and rely on the device's upscaling technology for lower-resolution content. This is a user-friendly decision. However, it may not be an AppleInsider-reader friendly decision. It is a choice made for the mass market, but the availability of the resolution menu covers that nicely for the setting-tweakers. For the finicky, changing resolution takes three button presses and three finger-flicks on the Siri Remote. That's it. Hardly an arduous task. The Apple TV 4K is an expensive streamer, for sure. A starting price of $179 is nothing to sneeze at. A 4K Roku can be had for less than that, and the very recent Amazon Fire HD box is even cheaper -- assuming you tolerate the ads and data mining associated with the company. But, a better way to look at is as an upgrade charge for your existing iTunes content, if you have any. The deal that Apple made with Hollywood to upgrade past HD purchases to 4K is unprecedented, and a great boon for consumers. In essence, if you've got 18 HD movies that you own from the iTunes store that are on the 4K list, the Apple TV 4K has essentially paid for itself. And, it doesn't matter if you bought them directly, or used a code from a Blu-Ray purchase. Our biggest issue right now here at AppleInsider isn't even a major one -- the lack of H.265 streaming from iTunes to the device with Home Sharing. While not ideal, it isn't a big deal. Other apps, like VLC, will play H.265 video straight from the device. At present, Plex looks like it's transcoding the video, but poking around it appears that support for straight H.265 streaming to the Apple TV 4K is coming in the future. What sells the device is the A10X processor. Like the A8 in the fourth generation Apple TV, the processor has enough push to do what it needs to do with style on a 4K television. And, Apple won't have to update the device for a few years because of it. Users screaming about the lack of HDR10+, Dolby Vision oddities, and what have you regarding video and audio delivery, are a disproportionally loud segment of the user base, tilting at windmills. The point of the Apple TV is an insertion of the Apple ecosystem on a user's television, as integrated as possible into Apple's services. That's what's been promised with the Apple TV 4K, and that's what's been delivered -- regardless of techies' complaints about X obscure feature missing from the device that only a minute portion of the audience really cares that deeply about. It is not a failed implementation of a set-top box. It is not compromised by supposed bad choices that Apple has made. It is a device specifically designed by Apple, to accommodate as many users as possible, and in that, it has succeeded admirably. Weaknesses of Apple's content delivery will be paved over, the same way that absent features on the iPhone have been dealt with for the last decade -- with solutions by developers. If you want a set-it-and-forget-it box for your 4K television, HDR or not, and you have at least one other Apple device, get the new Apple TV 4K. There is little to not like about it. Even if you don't have 4K, you're future-proofed for a few years at least and the power of the A10X is nice. However, if you either aren't bought into the Apple ecosystem with content or devices, or want to use Samsung's HDR10+, go elsewhere -- but you knew that well before you got this far into the review. Apple authorized resellers B&H and Adorama are accepting orders for the Apple TV 4K with instant discounts and no sales tax on orders shipped outside NY and NJ*. *B&H and Adorama will not collect sales tax on orders shipped outside NY and NJ*. There's a lot to like about the new ATV4k, but the lack of native (or source direct) is not insignificant. Not so much from a resolution upscaling perspective, but from a colorspace/dynamic range perspective. Right now, the ATV is not correctly passing the source color space/dynamic range unless you manually match the output resolution every time you change what kind of material you are watching. Otherwise, it performance fake/incorrect conversions which are simply not accurate. There are also significant issues with the HDR-10 base layer of Dolby Vision titles - they are not all correct, resulting in over saturated colors or severely clipped highlights. Since Dolby Vision systems are in the significant minority, while HDR-10 display are much more common, the ability for the ecosystem to deliver the correct HDR-10 base layer from Dolby Vision title is quite important. It's not clear if the issue is with the ATV, the iTunes store, or the encodes supplied by the studios...but the bottom line is it's the experience being delivered under the Apple banner. So, how does one best dump 4k video from iPhone in h.265 to Apple TV? Stream on Airplay or upload to iCloud and then download to Apple TV, or better, can I upload to Apple TV directly over the network? "But, we couldn't generate a H.265 file that would be recognized on the Apple TV. The file will load into iTunes, but Home Sharing just won't pick it up. This same file loaded into VLC plays fine, and isn't transcoded to a lower resolution. 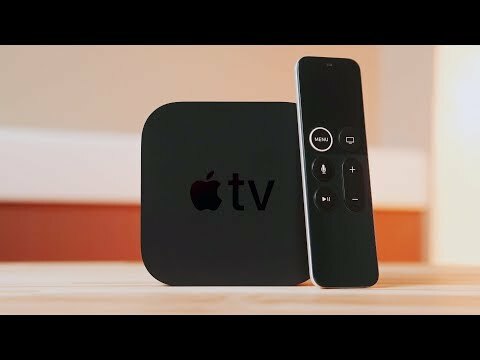 So, the lack of Home Sharing picking up the file isn't a technical limitation of the Apple TV 4K, and appears at this point to be a choice that someone made along the way to actively prevent this kind of thing.."
The studio do not want people ripping Blue-ray or getting 4K H.265 content for pirate site and being able to stream them to the ATV. I wonder if Plex from a media server would work. I don't disagree with the guess about it being a studio mandate -- but given the lack of solid information, can't say for certain. At present, Plex doesn't do it, but I expect an update soon will cover it. But, like I said, H.264 MP4 4K does work. The 4K ATV does handle HDR and Dolby Vision so why does the article say it does not? The only problem I found with the unit is the failed Dolby Vision Test which crashes when invoked. I then simply selected Dolby Vision 30 Hz refresh from the Audio/Video menu and all of the ATV output is generated at that resolution. The cable test passes just fine with my 20’ Monoprice Active High speed Premium HDMI cable. I am very happy with the unit working with my LG OLED 65E7P beautiful TV. My 2015 Samsung TV seems to do a good job of up scaling to 4K. Am I better off using the TV or the Apple TV for the upscaling? How would I set it up? It says nothing of the sort. It does say that it doesn't support HDR10+ -- which as I'm sure you're aware isn't the same. The first device in the stream does the upscaling -- in the normal case, the Apple TV. If the TV is already getting 4K resolution, it won't apply additional upscaling to it. You could always set the Apple TV resolution to a lower one, say, 1080p, and see how the television does on its own, and compare. Might be subjective. How come I cannot stream audio from Apple Watch to my Apple TV, 4K version or older?! Dumb. I can't even fathom a non-bizarre use case for this. What did you have in mind? I want a feature/setting on ATV 4K to strip out EVERYTHING content wise EXCEPT 4K or 4K w/Dolby Vision/HDR10 -- both 1st & 3rd party apps. Sometimes I just want to splurge in that content and HATE hunting for it! I agree with Gruber. I think Apple TV is one area where Apple should be more competitive on pricing. But with Apple TV, I’m hearing from a lot of people who are in the Apple ecosystem — people who own MacBooks, iPads, and iPhones — who just don’t want to spend $200 for an Apple TV when they can get a Roku or Fire TV for a lot less. The primary selling point of an Apple TV over these devices is iTunes. I love iTunes — I’ve bought hundreds of movies and TV series from iTunes over the years, knowing full well these purchases would be locked to the Apple ecosystem. I feel like my loyalty to iTunes is being rewarded now that I can get 4K versions of the movies I’ve already bought without paying another dime. No one sent me Blu-ray versions of the many movies I purchased on DVDs back in the day. But for people who don’t buy movies from iTunes — and generally don’t buy movies period, choosing only to stream from Netflix, Hulu, YouTube, Amazon Prime, etc. (and/or to assemble their home movie collection from copies that fall off trucks) — what does Apple TV offer to justify costing over twice as much? The computing power of the device and the popularity of iOS for gaming make Apple TV a decent casual gaming device, but it doesn’t ship with a gaming controller and even Apple describes Apple TV as a video platform first, gaming platform second. Just tried to play audio from watchOS 4.1 beta and the ONLY output possible is to bluetooth earbuds, no AirPlay or BT to ATV (nor Mac or iPhone either)! Makes no sense. NOPE. *A8* in previous gen.
Apple is charging a premium price (although considering what the box does, it's actually quite miraculous) compared to the competition. It seems to me that the technology should be leading edge as well. It is, as far as the processor is concerned. But it's not as far as HDR-10+ and Dolby Atmos is concerned. If Dolby Atmos is coming in a firmware update, fine - I don't think a few month delay is a big deal. But what about HDR-10+? If that's coming in the future via firmware update, that's also fine. But if it's not, it's not state of the art. And it will soon make the box non-competitive because several studios are moving towards HDR10+ so that they don't have to pay Dolby Vision licensing fees. Since Atmos is supposedly coming anyway, I won't bother to fully criticize your assumption that it's fine because of the cost of an Atmos sound system other than to say that Apple is a company that sells $1000+ iPhones and $3000+ properly equipped MBP's and that one can buy an Atmos 5.2.2 channel receiver for as little as $450 street price. According to the tech specs, the box only seems to support MPEG-4 at resolutions up to 640x480. I'm creating videos even in the mass-market iMovie at 1080p. And iMovie now supposedly supports 4K. So iMovie (and FinalCut Pro) can create it but Apple TV can't support it? I don't understand that. And why is this thing cutting out paragraph breaks? As someone waiting on the iPhone X -- to record 4K home videos of my 4 year old -- does this apply to iPhone or iMovie content as well? In other words, does the "Edit With... iTunes" function work with HEVC content that has captured on an iPhone & imported to Photos on High Sierra?